Psychology: when is a wristband more than a wristband? For many years people have used a rubber band placed around their wrist to help them successfully break bad habits and therefore make a change to their life. The 'science' is simple conditioning. Catch yourself 'doing' the behaviour that you want to stop. 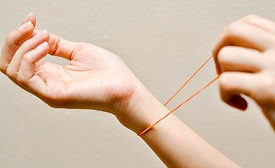 Pull and then let go of the rubber band so it twangs the sensitive skin of your wrist causing you mild discomfort. The idea allows you to i) learn to associate discomfort with the behaviour and ii) track the frequency of the undesirable behaviour (tracking). It's a little bit like Pavlov's dog in reverse. Our wrists have become advertising space for the messages and values which we want to express and the brands and organisations with which we feel strongly about and / or connected to. Using a wristband as an implementation tool to aid goal achievement is beneficial; the same positive feelings and representations can habitualised if one is wearing a wristband that supports the wearer's own aspirations & objectives. A strong reason to support the action, values, message carried by the wristband. A strong reason to wear the wristband. A strong reason to express my connectedness with the cause. I'm supporting this cause. I've made my decision. It's final. Unchanging. Unwavering. I've cut away any other options, and I'm going with this one. I believe without necessarily seeing that the aspiration/s represented by this wristband will be achieved. It isn't over until it's been 'won'; and until then I shall continue to wear this; support this; believe this; talk about this. Wearing this is testament to my support. I make no secret of my alignment with the values of this wristband's message. This is not just some whimsy attempt at a fashion statement. This message is worthy or a place on my wrist. Notice which way the wristband message is facing? Towards you not me. I want you to see the values I'm supporting here; consider them and join me. The GoalBand Success System is a leading world-class goal-setting and goal achievement system and it's completely FREE when you purchase your GoalBand wristband. 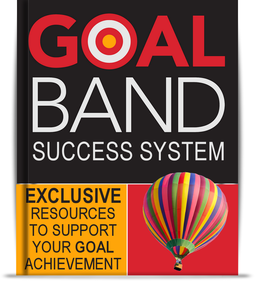 The GoalBand Success System is a simple to follow micro-book which comes complete with everything you need to consider, set and achieve your goals.